Update: As of 5pm, Tuesday 8/23/11 Monkey is now open! Monkey Paw on Facebook. If you’re reading this blog you probably recognize the name Scot Blair. If not you almost certainly will recognize the names of his drinking establishments: Hamilton’s Tavern, Small Bar and Eleven. Soon Downtown’s East Village neighborhood will have a new brewpub, courtesy of Scot Blair. Monkey Paw will be located on the corner of 16th St at F St where the Jewel Box used to be. Blair says things are moving along well and he expects the bar and restaurant portion of Monkey Paw to open within 60-90 days in late summer or early fall. The interior space is being completely remodeled, with almost nothing remaining from before. When Monkey Paw opens it’s doors they’ll have somewhere between 35 and 43 taps, pub food similar to Hamilton’s and Small Bar with a great cheesesteak as well as quality spirits. But Monkey Paw won’t only be a pub like Blair’s other establishment’s, it will be licensed to brew on premise making it a brewpub. “A brewpub has always been what I wanted to go after,” Blair tells me as he explains the idea behind Monkey Paw. The brewing portion of Monkey Paw will come sometime after the bar and restaurant portion opens, Blair says he hopes to be brewing by the end of the year but doesn’t yet know if it will happen. They’re still in the process of acquiring brewing equipment, which he tells me will be either a 7 barrel or 10 hectoliter (approximately 8.5 barrels) system. A brewer for Monkey Paw is lined up and they’ve been refining some of the beers they expect to brew at Monkey Paw on a homebrew pilot system but declined to name the brewer at this time. He did tell me the brewer is an award winning homebrewer, of which I have a guess or two as to who it might be, but won’t speculate right now. 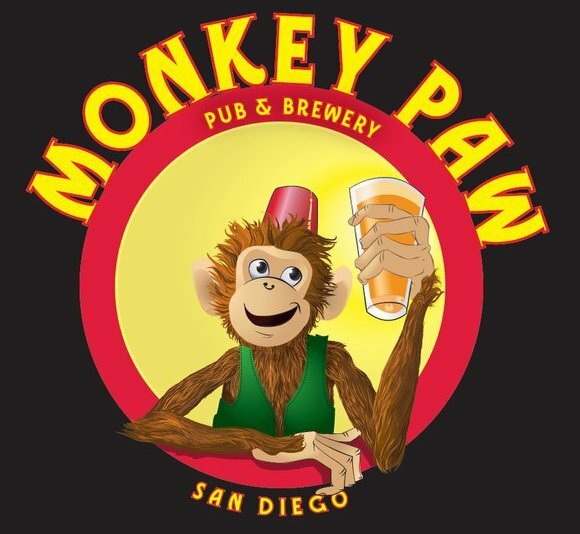 Beers brewed at Monkey Paw will get sprinkled around to other places, most likely Blair’s other bars and some beers might even make their way up the coast to LA or San Francisco, but not to expect the full lineup of Monkey Paw’s beers in one place outside the brewpub itself . The downtown neighborhood’s have come a long way in terms of craft beer in the last fews of years and it looks like Monkey Paw will continue this trend with another spot to get great beer downtown in addition to quality cocktails and food in what Blair assures me will be an unpretentious environment that aesthetically looks different than his other bars. Only time will tell what will happen with Monkey Paw and craft beer downtown, but if the success of Hamilton’s Tavern is any indication it could help turn Downtown’s East Village into a real beer destination as it adds to what is already there (Neighborhood and Mission Brewery). Eleven, the new bar from Scot Blair and Dennis Borlek, the guys behind Hamilton’s Tavern and Small Bar is now open. The space where Eleven is was previously Radio Room, and before that The Zombie Lounge, but Blair, Borlek, and Co. have done an impressive job of transforming the place. Located at 3519 El Cajon Blvd., the bar is dark inside, with few windows, a small stage in the back, this is a rock n’ roll bar with some nice touches. The bar top is all new, red velvet hangs from parts of the ceiling, record covers line some of the walls. Eleven has a full bar, and 16 taps of quality on what they’re calling their tap tower. They’ll also be doing beer events and pouring cask ale from time to time as well. Eleven will have live music, but we’re told they won’t have live music every night. We’ve known for a while now that a new bar from Blair and Borlek was coming, but one pleasant surprise was to see Louis Mello behind the bar. Louis will be the general manager of Eleven, and if you don’t know Louis’s name, you might recognize him. He was the owner of the Liar’s Club and knows a thing or two about beer. 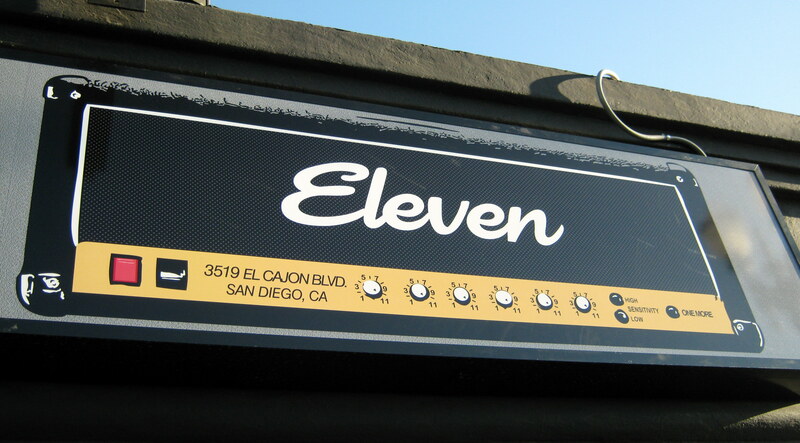 And speaking of beer, one of the taps you’ll find at Eleven is “Eleven Lager” brewed locally by Gordon Biersch. At $3.25 a pint it might be one of the best deals around, the board lists it as an American Pale Lager, but we’re told it’s actually a Helles lager. Click below for a few more (dark and blurry pictures) as well as the tap list as of last night (which is sure to change, but will give you an idea of the types of beer to expect). Russian River’s Pliny the Younger at Hamilton’s Tavern… In June? Posted by Jeff Hammett in hamilton's tavern, russian river brewing co. If you stopped into Hamilton’s Tavern recently you may have done a double take, or even stopped to check the date when you looked at the tap list and saw Russian River Brewing Co.’s Pliny The Younger being poured. Release annually early in the year (this year February 5th), Pliny the Younger is a much sought after Triple/Imperial IPA. Beer geeks line up for hours in advance and kegs run dry as fast as they can be emptied into pint glasses. Like most IPAs, it is recommended Pliny the Younger be drunken as fresh as possible, so why was it on tap at Hamilton’s four months after it was release? The answer is pretty simple. 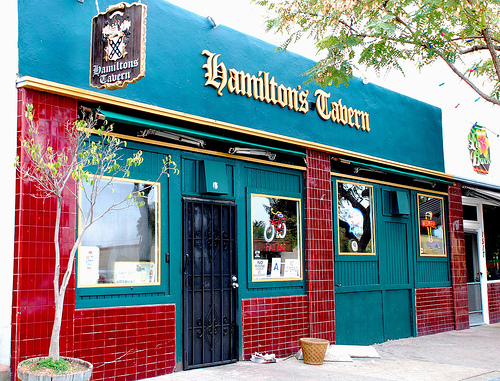 “It wasn’t held onto by design but by misfortune as the keg was mislabeled”, explains Scot Blair of Hamilton’s Tavern. “There was an Imperial Stout keg collar on the keg we were aging… When it was tapped, low and behold it wasn’t Imp Stout, it was a high gravity hoppy beer, under the keg collar was the true entity RR Pty.” Beer drinkers come out in droves when Pliny the Younger is released, so it’s not hard to imagine how a full keg could get misplaced, even of such a sought after beer. I wasn’t at Hamilton’s when they originally tapped it earlier this year, but I imagine it was nothing short of a zoo. Dennis Borlek, the General Manager at Hamilton’s, who found the keg, did what any curious beer geek would do: he tasted it. And it was still good. Scott explained that there was a slight softening of the hops, but otherwise it was still a phenomenal beer. So they left it on tap, and it didn’t disappoint. The keg was empty less than 24 hours later. Anyone out there get to try it? Leave a comment below, especially if you tasted it fresh this past year.